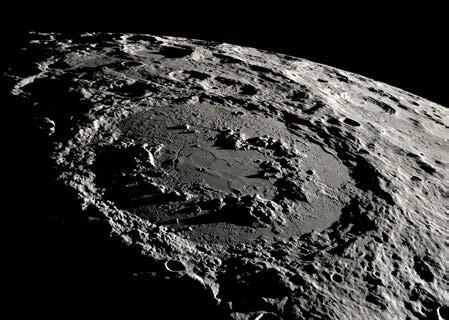 A team of scientists led by Universities Space Research Association’s David Kring at the Lunar and Planetary Institute is using observations of the Moon to further understand the impact on Earth that is linked to the extinction of the dinosaurs. The team concludes that the mountain-sized rings that form in the Moon’s largest impact craters were produced by the collapse of central uplifts that rose tens of kilometers above the surface as a result of the impact. Those findings, based on observations of the Moon’s Schrödinger basin, with implications for Earth’s Chicxulub crater, are published in the current edition of Nature Communications. The Chicxulub crater is the best-preserved example of a peak-ring basin on Earth, but it is buried beneath approximately 1 kilometer of sediments. By comparison, the Schrödinger impact basin is the best-preserved basin of its size on the Moon; however, unlike the Chicxulub crater, it is exquisitely exposed on the lunar surface and accessible to study using remote sensing techniques. Scientists addressed a key question related to both basins regarding the formation of their mountain-sized peak rings. New geologic mapping of the 2.5-kilometer-high peak ring in Schrödinger suggests the rock was uplifted from the Moon’s middle to lower crust. That geologic mapping, plus complex computer simulations of the impact event, indicates that rock from depths down to 30 kilometers below the lunar surface rose in a central uplift, towered briefly at least 20 kilometers above the lunar surface, before collapsing outward to form the circular range of mountains seen today. Within an hour of impact, a new 320-kilometer-wide basin and its enormous peak ring had been created on the Moon. Similar processes occurred when the Chicxulub crater formed on Earth 66 million years ago, although those processes occurred faster due to Earth’s greater gravity. The Chicxulub impact event is famous because of its link to the extinction of dinosaurs. Because the Schrödinger basin’s peak ring came from the middle to lower crust of the Moon, it can be used to test the lunar magma ocean hypothesis and, thus, how the Moon was transformed from a molten mass into a rocky planetary body. That hypothesis suggests the Moon was once molten and, as it cooled, differentiated into layers with unique crystal compositions. The authors identified specific rocky exposures in the peak ring that robotic rovers and astronauts can sample in the future to further test that hypothesis. 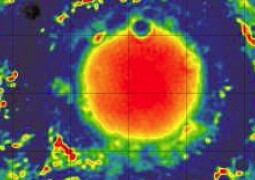 Kring worked closely with LPI’s Georgiana Kramer and Mitali Chandnani (formerly of the LPI and now at the University of Alaska), who used spacecraft data from the Lunar Reconnaissance Orbiter and the Chandrayaan-1 orbiter to map the geology of the Schrödinger peak ring. Co-authors Gareth Collins (Imperial College London) and Ross Potter (formerly of the LPI and now at Brown University) took the lead on computer simulations of the Schrödinger impact event. The work by Kring, Kramer, Potter, and Chandnani was supported at the LPI by cooperative agreements to the USRA from NASA’s Planetary Science Division and Solar System Exploration Research Virtual Institute. The work by Collins was supported by the UK Science and Technology Facilities Council. Nature Communications is an online only journal. The online version of the article can be considered definitive. These papers will be citable via a digital object identifier (DOI) number. The DOI for this paper will be 10.1038/ncomms13161. Once published, the paper will be available to view online at http://www.nature.com/articles/doi:10.1038/NCOMMS13161. Illustration 1: The Moon’s 320-kilometer-diameter Schrödinger basin is the best preserved impact basin of its size. Its broad flat floor offers several safe landing sites, and the geology within the basin is extraordinary. The 2.5-kilometer-high peak ring is 150 kilometers in diameter. During the impact event, rock rose from deep within the lunar crust and towered briefly in a central peak over the lunar surface before collapsing downward under the influence of gravity and flowing to form the mountainous peak ring seen today. A similar process is envisioned for the Chicxulub crater on Earth, which is related to the extinction of dinosaurs 66 million years ago. Illustration credit: NASA Scientific Visualization Studio (NASA SVS). Illustration 2: Artistic interpretation of the formation of the Schrödinger impact basin on the Moon near the end of the basin-forming epoch ~3.9 billion years ago when the Moon was closer to Earth. This basin was produced during a period of late heavy bombardment that resurfaced both the Moon and Earth. The impact was probably caused by an asteroid, because asteroid impactors dominated cometary impactors at that time. The science captured in this scene was developed by David Kring and Daniel Durda. The art was produced (© 2011) by Daniel Durda (Fellow, IAAA). 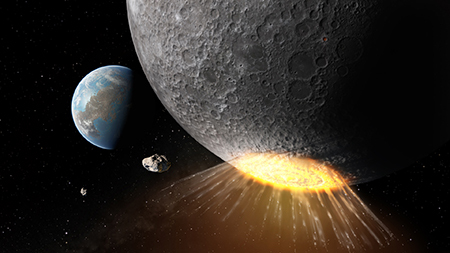 Video computer simulations of a Chicxulub-sized cratering event on Earth and the same-sized event on the Moon are available for download at http://www.lpi.usra.edu/exploration/training/resources/impact_cratering/. The Lunar and Planetary Institute (LPI), a division of the Universities Space Research Association, was established during the Apollo missions to foster international collaboration and to serve as a repository for information gathered during the early years of the space program. 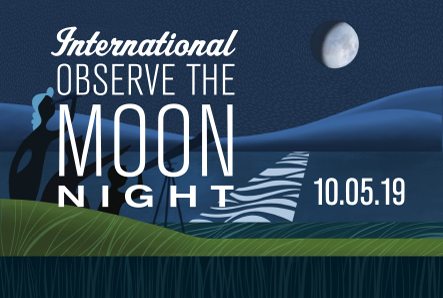 Today, LPI is an intellectual leader in lunar and planetary science. The Institute serves as a scientific forum attracting world-class visiting scientists, postdoctoral fellows, students, and resident experts; supports and serves the research community through newsletters, meetings, and other activities; collects and disseminates planetary data while facilitating the community’s access to NASA science; and engages and excites, and educates the public about space science and invests in the development of future generations of explorers. The research carried out at LPI supports NASA’s efforts to explore the solar system.